Former Gov. Paul LePage speaks at the Republican Convention in Augusta on May 5, 2018. Good morning from Augusta. The state’s two main political parties picked their leaders over the weekend, with the candidates favored by former Gov. Paul LePage and Gov. Janet Mills winning out in the Republican and Democratic parties, respectively. Maine Republican Party Chair Demi Kouzounas survived a challenge after a difficult 2018 election and the new state Democratic chair will be Kathleen Marra, an activist whose role through the 2020 will mostly be behind the scenes. The Republican race was fractured, with a longtime legislative leader dropping out of the chair’s race the night before and citing a personality cult in the party. That was a nod at LePage, who is still the politician who most animates the grass-roots even after leaving the Blaine House. LePage wrested control of the party during his tenure as governor. 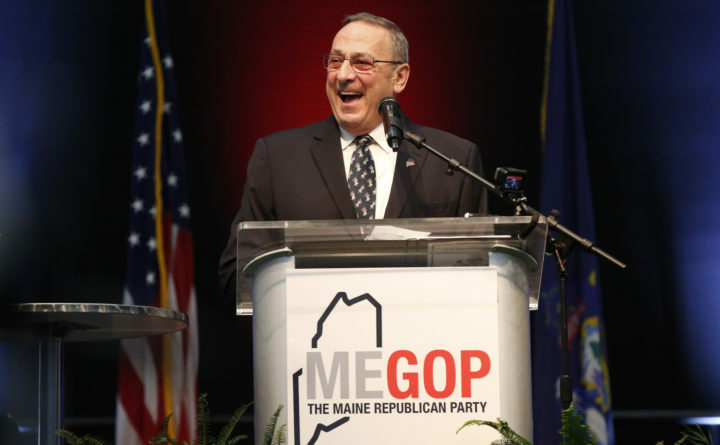 The former governor never shied away from conflict during his tenure and there was mild conflict around control of the Maine Republican Party after LePage and Republicans stormed to control of the executive and legislative branches in 2010 for the first time in four decades. Mills and Democrats had a bigger wave election in 2018. For the rest of LePage’s tenure, the candidates he endorsed for party chair all won the seat. That includes Kouzounas, a dentist from Saco who took over the party in 2017 and made few changes, retaining a staff led by longtime LePage ally Jason Savage, the executive director. The party may be molded in LePage’s image now more than ever. In December, LePage wrote a long Kouzounas endorsement to the party’s state committee that partially blamed 2018 election losses on an uncooperative group of Senate Republicans, with whom the former governor clashed for the last four years of his tenure. That looked to be aimed at former Senate Majority Leader Garrett Mason, who was running against Kouzounas alongside a third challenger, former state Rep. Heather Sirocki. But Mason got little momentum and dropped out the evening before the vote. In an email, he said there is a “cult of personality” in the party in which individuals and not ideas are celebrated. Kouzounas told the state committee the party has been “too nice” in her tenure. In her second term, she would instruct a communications person to “literally ‘Tweet’ daily kinda like” President Donald Trump and start a nonprofit with LePage to rival the liberal Maine People’s Alliance. Waterville Mayor Nick Isgro, a controversial figure who narrowly won a June recall after tweeting “Eat it, Hogg” to a Florida school shooting survivor who embraced gun control, was elected vice chair of the party with no opposition. All of these signs point to a more confrontational party in 2019 — just as the former governor would probably like it. With Democrats holding power, their new chair will probably be quieter. Marra, a party activist who previously held leadership posts in York County and was among a group of people arrested at a Blaine House protest last year, beat Melissa Sterry with Mills’ support on Sunday. Since Democrats won the governor’s race, flipped the 2nd Congressional District to install U.S. Rep. Jared Golden and won legislative majorities, there will be no shortage of high-profile Democratic spokespeople. The party will be easier to lead than Republicans because of that. Still, Democrats have a big job through 2020, when they’ll try to protect Golden and oust Trump and U.S. Sen. Susan Collins. As we’ve seen recently, a lot can change in an election cycle. It’s still a time for introductions and training at the State House. The House and Senate do not convene again until Tuesday, and most of their early floor actions will be continuing to refer proposed legislation to committees. Legislative committees start meeting this week. Those meetings kick off today for the education, Inland Fisheries and Wildlife, and Veterans and Legal Affairs committees. These are largely to allow committee members to get acquainted with each other, committee staff and lobbyists. Little of public consequence will happen until they hold confirmation hearings on Cabinet nominees or schedule work sessions to vote on proposed legislation. Click here for this week’s schedule and for audio links to committee hearings. Here is their soundtrack. — To kick off his re-election year, the mayor of Portland will propose municipal public campaign financing and lobbyist disclosure mandates. During his annual State of the City address this evening, Ethan Strimling will offer details of proposals to have Portland install a so-called Clean Election fund and demand its elected officials disclose meetings with lobbyists and other influencers if it does so. At the state level, candidates for governor, the House and Senate can use tax dollars to fund their campaigns for office as long as they reach minimum thresholds of individual campaign donations of between $5 and $100. Portland City Council districts are about twice the size of Maine House districts. A House candidate can get about $15,000 in public funding for a contested general election if he or she maximizes qualifying donations, so if a commensurate program is put in place in Portland, each council candidate could cost the city around $30,000. — The previous Congress whiffed on a bid to aid shellfish harvesters and worm diggers near Acadia, so Maine’s delegation has submitted a similar proposal. The new proposal updates bills that Sen. Angus King and then-U.S. Rep. Bruce Poliquin submitted in January 2017. The House passed the bill in March of last year but it failed to make it through the Senate and lapsed at the end of the 115th Congress. The delegation continues to work to clarify federal laws to allow clammers, worm diggers and other marine harvesters to continue to ply their trades by traditional means in the intertidal zone along Acadia National Park’s shore. — Federal workers are invoking the anti-slavery constitutional amendment in a new government shutdown lawsuit. A group of federal workers who haven’t been paid during the government shutdown are suing the Trump administration for forcing them into involuntary servitude. The four Texas and West Virginia plaintiffs, who have continued working without pay since the government shut down Dec. 22, claim the Trump administration and their bosses have violated the 13th Amendment, which famously abolished slavery and involuntary servitude after the Civil War. The lawsuit, filed last week in the U.S. District Court for the District of Columbia, is at least the third filed against the Trump administration since the shutdown began 23 days ago. A recent story about a student from Orono working with the mechanical engineering department at Worcester Polytechnic Institute to design a better sneaker triggered an odd mix of memories for me. On the day after I turned 16, I started work as a summer intern for the mechanical engineering department at WPI. My dad got me the job. It was nepotism at its polytechnic best, but I am not ashamed. It was a six-week gig that earned me some much needed cash and kept me out of trouble. It also allowed the WPI scientists to dish off menial tasks to me so they could concentrate on innovation and scholarly pursuits. I spent the mornings running cable through steam tunnels, empty dormitories and gymnasium rafters to help establish the infrastructure for a campus communications network. I also used a big, bulky camera to record students presenting the results of their research. WPI emphasized real-world applications of schoolwork, so back in the 1970s, students and professors — including my dad and the guys I worked for in the ME department — were tinkering with space travel, lasers, battery chargers, microchips and the nuts and bolts of the information technology that we take for granted today. It was like Hogwarts for science. My afternoon duty was to record the televised Watergate hearings. I would sit in a hot basement office, splicing wires and making switches as the televised hearings droned on. When a recording cartridge the size of a brick clicked, signalling a new one was needed, I would have to jump up, pull it out and maneuver a new one into place. At the time, the history-making aspect of the Watergate hearings was not the role they played in ousting President Richard Nixon. It was simply that t hey were televised, Americans had rarely seen Congress in action, so the opportunity to do so while sitting at home — or in the basement of a college building — was a really big deal. I earned $1.60 an hour by helping to save it for posterity — or at least until the recordings could be transcribed. The televised hearings introduced the nation to “Young Bill Cohen,” the first-term U.S. representative from Bangor who went on to a distinguished career in Congress and as Bill Clinton’s secretary of defense. But in 1973 and 1974, he was almost always introduced as if “Young” was his first name.